Russell Westbrook withdrew both hands and showed them to the official to hear his fate. Foul. His sixth. The thunder followed with 7.3 seconds on the clock, and he could do nothing more. 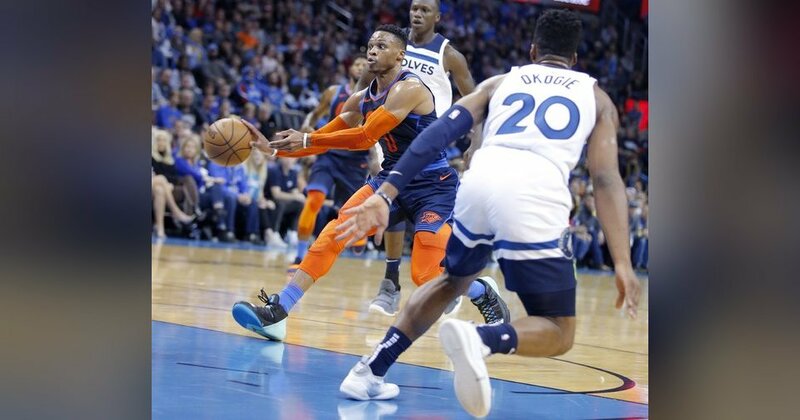 He watched from the bench as Paul Georges last ditch missed the last shot and the thunder on the Timberwolves 114-112 fell on Sunday night. For the second night in a row, the Thunder failed to make a comeback for the fourth quarter. Westbrook, who scored 23 points in 19 strikes, had his most efficient game in weeks. But even that, along with George's 30-point point game, was not quite enough in the Chesapeake Energy Arena. "I think we made the track well," said Grant. "Could have taken a few more shots, a few more stops, but I agree with what we did." Just under seven minutes before the start of the game Westbrook jumped into the fast lane to pick up a pass from Minnesota's Jerryd Bayless.